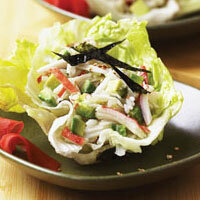 Crab-filled lettuce cups make a refreshing appetizer or quick lunch. Lettuce cups:Cut off the bottom third of the lettuce head. Soak lettuce top in ice water for 10 minutes - this will help separate the leaves. Carefully separate the outer lettuce leaves, one at a time, to make the cups. Using scissors, trim each lettuce cup to form circles. A head of iceberg should yield 8 to 10 lettuce cups. Save the lettuce core for a chopped lettuce salad. Salad:Combine Alaska Surimi Seafood, cooked rice, cucumber and avocado in a large bowl. Add salad dressing; toss to coat all ingredients. Place lettuce cups on a large plate and fill each with about 1/2 cup of the surimi-rice filling. Garnish with pickled ginger (optional), nori (optional) and sesame seeds to serve.